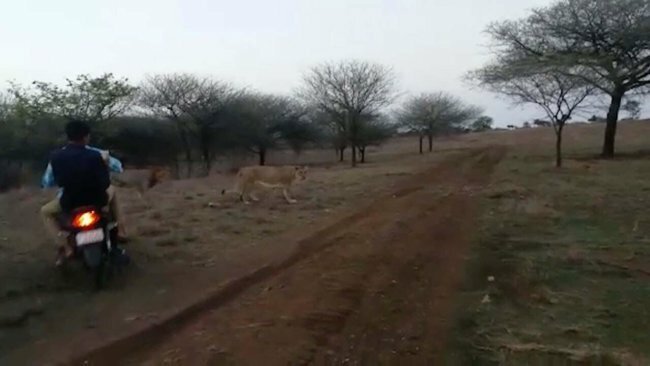 In Rajkot, India, a disturbing video released on Tuesday, of three men harassing a pride of lions by chasing them on motor bikes, has gone viral as hundreds of comments from viewers continue to condemn the men’s reckless behavior. According to the Times of India, the video was shot in the village of Amreli and showed two men on motor bikes with another person holding a mobile camera as he chases five lions. The frightened animals can be seen frantically running away as the men speed up their noisy bikes to chase them. There are estimated to be 100 lions in the Amreli district that live in the area close to humans. The Rajkot Conservator of Forest organization that controls the area were made aware of the video on Monday evening and have been investigating the identity of the men. “We have got the RTO registration number of bike and based on this, we will track the perpetrators very soon,” stated A.C. Patel.